A "petulant" Nelson man smashed a window at his estranged partner's home, after she told him she couldn't meet him, a court heard. Haroon Hussain (23) threw a stone at the property, owned by her mother and caused damage to the tune of £95 to the window. Hussain, who has one previous conviction for a motoring offence from 2013, admitted criminal damage in Nelson, on March 9th. The defendant, of Beaufort Street, Nelson, was ordered to pay £95 compensation. He is on job seeker's allowance. 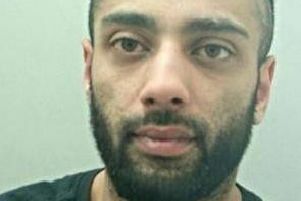 Miss Parveen Akhtar (prosecuting) said Hussain made several phone calls to his estranged girlfriend and suggested meeting up. She continued: "She said she was unable to meet him. He turned up at her home, picked up a large stone and threw it through the window, smashing it." Mr Keith Rennison (defending) said there had been text messages between him and his girlfriend, they arranged to meet, but she reneged on that.